FG Trading’s Alcopanel FR aluminium composite panels offer architects a wide range of cladding solutions without compromising on fire safety. The popularity of aluminium composite cladding for building exteriors has grown over the last decade, thanks to the lightweight material’s ability to add good insulation without exerting additional force on the exterior of the building. Aluminium composite panels further offer excellent weather resistance, are relatively easy to install and are low maintenance, since accumulated dust and dirt can be washed away by rain or with water. The problem, however, with traditional aluminium composite panels is their flammable polyethylene or polyurethane thermoplastic core, sandwiched between two sheets of aluminium. This makes traditional panels highly combustible and in the event of a fire, they can cause fire to spread rapidly across the façade and burn out of control, especially on high-rise buildings. FG Trading is the exclusive Southern African distributor of the world-renowned Alcopanel FR aluminium composite panels, which offer architects a wide range of cladding solutions without compromising on fire safety. These fire-rated panels have a non-flammable mineral core between two aluminium sheets that prevents fire spreading, is non-toxic and does not release poisonous gases during a fire. Apart from being environmentally friendly, the panels are also chemical, corrosion and weather resistant. In addition, Alcopanel FR’s Kynar 500 high-performance PVDF coating boasts self-cleaning properties. Alcopanel FR is specifically designed for architectural cladding and provides a modern, aesthetically-pleasing finish. Not limited to exterior applications, it can also be used as a decorative element on ceilings or columns. The panels are extremely versatile – they come in a wide variety of colours and finishes and can be machined easily to suit various building shapes and contours. 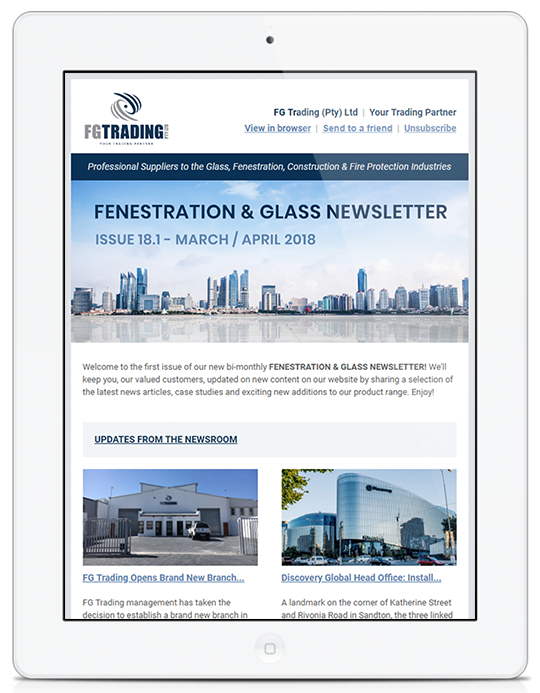 As professional suppliers to the glass and glazing industries, FG Trading does not compromise on quality and believes in providing only the very best products.